The Education and Training Team has developed a checklist for LIS supervisors to go over with new staff (although we think some not-so-new staff may appreciate this as well). You can find it on the LIS page under “About LIS.” We’ve incorporated input from the AD’s and manager’s group and it will change over time as we get more feedback. Our intention is that the supervisor (perhaps with help from other designated colleagues) will work through this checklist with new hires, explaining and answering questions as they go along. It is not meant to be a self-service learning tool, although new staff can use it to go back and explore topics more in-depth on their own. You’ll notice some entries have a link and some don’t. We only linked to things that weren’t already major links on our public LIS pages so new staff learn to navigate the LIS site as well as become familiar with major “go” shortcuts. We hope our new checklist will help supervisors get new staff off to a great start in LIS! This entry was posted in LIS Staff Interest and tagged Education & Training, orientation on July 13, 2012 by Brenda Ellis. Yesterday Pij and I represented LIS at the Road Map to Student Services event; part of First Year Orientation, which was held concurrently with the Academic Forum in Kenyon. Half of the incoming First Year class attended the Forum while the other half were given “Passports” and asked to collect stickers from each Student Services station they visited (after which they were rewarded with a “frozen novelty”). Then they switched, and the students who had already attended the Forum attended the Road Map event. Since Pij and I handed out a sticker to every student with whom we spoke during the 2.5 hour event, it was easy to keep track of how many we’d spoken with—over 80! No wonder my voice is a little hoarse today. What kinds of questions did we field? Pij may have heard other questions, but I think by far the most common questions were relating to connecting to Wireless, installing Microsoft Office, and followed by general questions about how to find/check out books and other materials from the Library. Other questions I heard ranged from “What is LIS”, to “Do you have any job openings?”, to “Can you help me set up email on my smartphone?”. Quite a few students stopped by without specific questions, and Pij’s go-to prompt, “Have you been able to set up your computer okay?” was great at drawing out other concerns and questions. I copied her and used that question quite a few times, and also tried asking about their First Year Seminar courses, which gave me a chance to let them know that a Librarian was assigned to each course, as well as a Peer Mentor and explain about CTLR and how it was related to the Library. All in all it was a great chance to meet new students, hear how things were going for them, and also learn (from Pij) what to say about some of the most common tech-troubleshooting questions. It also underscored for me how essential it was for Pij and I (as LIS representatives) to be fully up-to-speed on recent and forthcoming changes in technology infrastructure and research tools. This entry was posted in LIS Staff Interest and tagged orientation, publicity, research advice, students, technology tips on September 9, 2011 by Jess Isler. Here’s a rough list of ideas that we developed at a recent meeting to figure out how we can systematically make sure that all of our new LIS staff members are provided with opportunities to learn about LIS and the College. Revive the new employee handbook–> Carol thinks she might have a copy of this somewhere. Please feel free to make further suggestions using the comments below. It isn’t clear that there will be time or energy or interest to do all of these things. For now we just want to continue to brainstorm ideas. This entry was posted in LIS Staff Interest and tagged LIS Administration, lis staff, orientation on May 28, 2010 by Michael Roy. This entry was posted in LIS Staff Interest and tagged Areas and Workgroups, assessment, Manager's Meeting, Middlebury, orientation, planning on May 20, 2010 by Michael Roy. This entry was posted in LIS Staff Interest and tagged LIS, LIS Administration, orientation, Photos, Sep 5 2008 on September 6, 2008 by Doreen Bernier. On Wed., September 3rd the Main Library will be transformed into an Orientation Information Center for incoming students and their families. Offices from across campus that provide student services will have information tables set up in the Atrium, along with some local organizations. Several local banks will have representatives in the Harman Periodicals Reading Room so students can set up bank accounts. 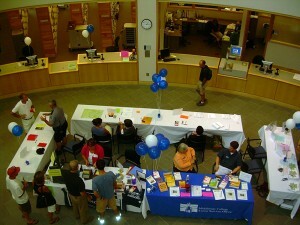 The Information Center is part of a new approach to orientation. Instead of a welcome center being set up at Kenyon, students will be welcomed at their individual commons offices. All the campus-wide offices that would have been in a central welcome center will be at the Information Center in the Main Lib. LIS is fortunate to be hosting this Info Center because it gives us a chance to also feature our services. For more information contact Joseph Watson. This entry was posted in LIS Staff Interest and tagged Aug 29 2008, LIS, orientation, students on August 30, 2008 by Doreen Bernier.